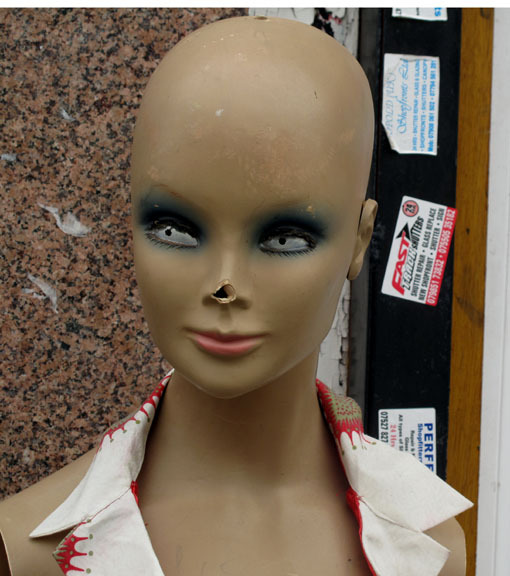 I confess to a fascination for mannequins. Peckham often satisfies this particular interest, but with an added twist of zaniness. The model may have one leg, no legs or no torso. It may have a head but no hair. A mannequin might be perfect, except he has no arms. Still, he stands doing his job. Yesterday I spotted one of a child (headless) that I’d seen in an arcade months ago. She now stands in a different arcade, but wears the same polka dot dress. It was like seeing an old friend who had not changed with the passage of time. This entry was posted in Peckham, Photography, Writing and tagged imperfection, mannequins, models, Peckham, street photography. Bookmark the permalink.